Okay, it's not exactly a robot—but I bet it's still the craziest thing you've seen all day. 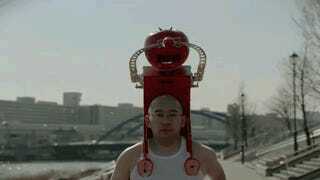 Japanese juice and ketchup company Kagome built a freaking wearable tomato dispenser for a runner at the Japan Marathon this weekend. What's really going on here? Believe it or not, it's a PR stunt to promote tomatoes over bananas. Dole Japan has sponsored the Japan Marathon since 2008, and reportedly provides giant bins of bananas every year to keep runners going. Kagome would obviously love if those runners picked tomatoes instead.